Imogen Ze’keals is a Rank Three wish-granting angel—and angels are expressly forbidden to become personally involved with the humans from their case files. But how can she resist Griffin Donovan’s aching heart, his bone-deep kindness and his sharply intelligent scientist’s brain? Griffin is a scientist and a committed non-believer. Despite his neuroscientific research attempting to explain spiritual phenomena in terms of human brain chemistry, there’s no way in heaven or hell he’ll ever admit angels are real—except he can’t deny the all-too-real existence of the winged temptress who’s been showing up in his dreams…and who just appeared on his doorstep. 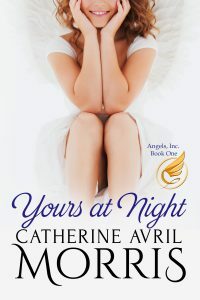 As Griffin and Imogen’s fates become more deeply entangled, an age-old battle between angels light and dark plays out over time and through several dimensions—and as the two become lovers, they are swept up in the crisis. to bind them together from one world to another?